The microUSB port is one of the best things that has ever happened (and is still happening) to mobile phones. But not so much because of the port specifics themselves (though the slim profile and the life of 10000 insertion and removal cycles do sound impressive). What makes microUSB so special is the fact that all major manufacturers agreed to use it. In case you have forgotten here's how things worked before that. If you happened to have two or more mobile phones, you would usually need a different charger for each and a separate data cable for every device, which most probably wouldn't charge your device. And then when you change one of those handsets, you wouldn't be able to use the old cables as they were incompatible. In fact manufacturers liked it that way since they got a cut out of the accessories sales as well. The microUSB port offered USB connectivity, sound and charging along with a slim profile, so when the European Commision demanded that manufacturers unite around a common connectivity port, it wasn't surprising that they picked microUSB out of all proprietary options. Motorola was first to use the microUSB port in their phones starting with their Q 9h smartphone and later on with the V8 and V9 RAZR devices. Then Nokia followed suit and with BlackBerry and the Korean companies joining the party in the 2008 and 2009 it was settled. Even Sony Ericsson is starting to give up on its FastPort nowadays and is going microUSB with at least some of its phones. Apple is the only major player nowadays that still refuses to give microUSB a chance but they seem to insist on their closed eco system of devices, software and accessories. Even Apple will go the microUSB way (in Europe anyway) - they've signed the EU agreement for a single charger standard along other big players. The agreement will come into effect in 2011 and all new phones sold in Europe will use microUSB for charging. The US doesn't yet have such an agreement coming into effect soon - Apple and RIM are not very keen on the idea, but unless they plan to manufacture two separate devices for the US and Europe, they just will have to go through with it eventually. 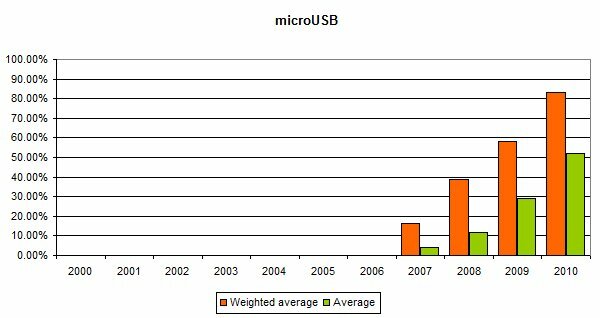 Of course every transition takes its time but the microUSB adoption is downright impressive. The share of devices sporting the new standard doubles every year after its announcement, surpassing 50% in 2010. What's more the weighted average figure tells us that those 51.8% of devices are actually 83% of all devices worth noting. If the trend continues in a couple of years all this fragmentation will be gone worldwide. You would need one cable for all your mobile phones, which will do for both charging and data transfers. Here's hoping. The only thing we can see as a potential obstacle to the microUSB universal adoption is its poor music reproduction quality. We saw a few attempts by different manufacturers to use the microUSB slot as a headphones connector too, but apparently you just can't get an audio output that's clean enough through that port. So on high-end devices microUSB goes hand in hand with a standard 3.5mm audio jack, which leads us onto our next chapter. 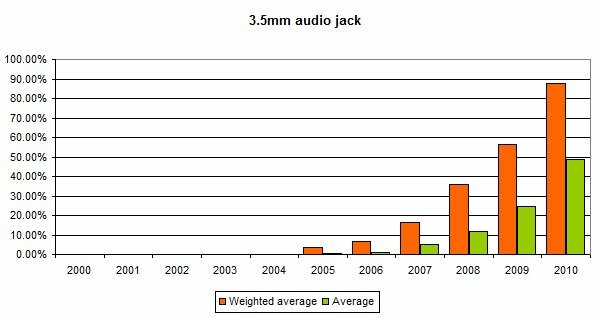 With dedicated MP3 player being around for such a long time, one might wonder why 3.5mm jacks weren't implemented much earlier. You know - why did we have to wait for Nokia N91 in 2005 for the standard audio jack to debut on mobile phones? The thing is 3.5mm audio jacks only make sense for listening to music and before that no handset was particularly good for that task. They had neither good enough audio output nor enough storage space. And the N91 was a real game changer, showing that a mobile phone can fully replace your MP3 player. And ever since then there was no turning back. Everyone wanted a 3.5 jack on their next handset and it's no coincidence that each year the share of those mobiles has roughly doubled. With storage space cost falling drastically and minimization of other hardware allowing more space for a larger battery the mobile phones are starting to look more and more as a threat to dedicated music player. And that makes the 3.5mm audio jack a necessity rather than an extra. So this year 3.5mm audio jack-enabled devices might account to just under half of all announcements, but that is the half that generates nearly 90% of all hits on our website. We sure hope that in two years time audio jacks won't be a feature to boast about, but something that goes without saying.